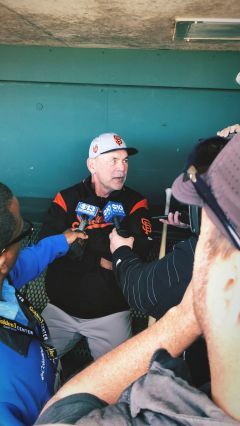 WEST SACRAMENTO, CA (MPG) - Spring Training came and went in the blink of an eye for a San Francisco Giants organization determined to make another playoff run. In what has been a busy offseason full of big moves for the club, anticipation and expectations are high. For the second time ever, the Giants broke camp and headed home – but not to San Francisco, rather Sacramento. The River Cats hosted their big league club in what was a welcoming Saturday afternoon for both players and fans. Fans tailgated and lined up outside Raley Field early, knowing that it was their best opportunity to catch their favorite players in such an intimate setting. During batting practice Giants players took the time to sign autographs down the right field line for a large group of diehards with Brandon Belt, Hunter Pence, Brandon Crawford and Pablo Sandoval leading the way. The only downer during the day was talk of the recent injury of ace Madison Bumgarner, who suffered a broken hand from a line drive just one day prior during his final spring tune up. Manager Bruce Bochy addressed the media before the game, broaching the subject that was on everyone’s mind. “It’s looking like a couple of months, give or take,” said the Giants manager. 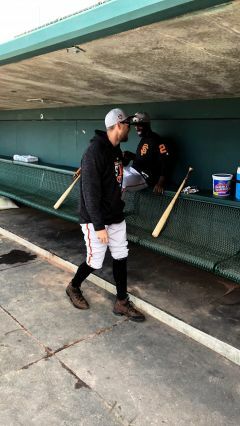 “Surgery went well.” Bumgarner, who suffered an injured shoulder and missed three months last season after a dirt bike accident, was looking like a man with something to prove this spring. “He looked as good as I’d seen him,” said a solemn Bochy, who is already down both Bumgarner and starter Jeff Samardzija to begin the season. But the Giants manager also had some positive things to say about his ace’s absence. “I feel good about this club and their ability to handle something like this.” Bochy’s timetable of an early June Bumgarner return is earlier than initial reports. The additions of Andrew McCutchen and Evan Longoria along with the resurgence of Sandoval and a healthy roster of familiar faces put the Giants in a great position as they head into the regular season. On the River Cats side of things, Mac Williamson is one of the biggest names who didn’t make the big league roster. Williamson tore it up this spring, hitting .318 with four homers and 14 RBIs. 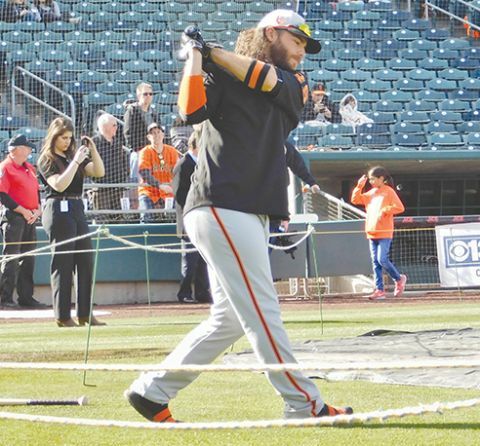 But the rejuvenated 27-year-old found himself in a crowded outfield that already consists of Hunter Pence, newly acquired McCutchen and Austin Jackson plus veterans Gregor Blanco, Gorkys Hernandez and possibly rookie Steven Duggar. For a team that could hardly put together enough beating hearts for an outfield a season ago, a crowded one isn’t a bad thing. It should be an exciting season for both clubs as they have rosters full of talent – especially offensively. One of the newest River Cats, Saint Mary’s High School and College alum Kyle Jensen, has already left his mark, going yard yet again on Saturday. The first baseman is hitting .333 with five home runs and 10 RBIs this spring. Formerly of the Reno Aces, where he hit 30 homers and drove in 120 runs in 2016, Jensen spent last season playing in Japan before coming home and signing with the Giants organization. The Giants jump right into the thick of things, opening up their regular season in Los Angeles with a four game set against the Dodgers beginning March 29. Their home opener is Tuesday, April 3 as they host the Seattle Mariners in interleague play. The River Cats start the season on the road against the Tacoma Rainiers on April 5. Their home opener will be against the Reno Aces on Tuesday, April 10.